It is impossible to find a good and experienced blackjack player who will tell you that it is useless to know and follow basic blackjack strategy: it is such a thing which should be learnt, remembered and used by every blackjack player if s/he wants to win this noble card game. Basic blackjack strategy is shown us in the form of a table which was worked out and described by mathematicians. According to this table, there are some moments of a blackjack game when a player should do the exact step: hit, stand, double down etc. When you use such a scheme, you can really reduce the chances of a dealer for winning or, at least, reduce the house edge to 1% or less. Look at the next section where you can find basic blackjack strategy charts: they are easy to use and you can easily print them for more comfortable usage. All you need to do is to find your card combination and a dealer's one there and find out the best tip for such a situation at the crossing of these two card combinations. If your hand is 8 or less points total, always HIT. A soft hand is a card hand which contains an Ace that can be counted as 11 points without being bust: it is called to be soft because you will never bust if you have such a hand and ask for one more card. When a player HITs, soft hand may still remain to be soft (depends on how many points you give for an Ace - 1 or 11) or it may become to be hard hand. If it becomes to be a hard hand, you should follow the blackjack strategy for hard hands. Example: you have a hand of an Ace + 7 = soft hand of 18 points. You ask for a third card and it is 7. Now you have a hard hand of 15 points: 7 + 7 + an Ace (counted as 1 point, otherwise you will bust) = 15. So, now your hand is a hard one, so, follow the strategy for the hard hands now. When a player has two cards of identical value (7+7 or 9+9 for example), s/he is usually offered to SPLIT and play with 2 different hands now. 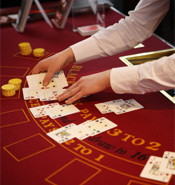 Such hands are called to be paired hands (Kings, Queens, Jacks can also be split, though some casinos do not allow such an option). All pairs should be split except 5's. There is a small misunderstanding for the pairs of 8's: according to the strategy charts, they should always be split except the cases when a dealer has an Ace. But if a dealer has a stronger card then it is better to surrender pairs of 8's. But whatever a dealer's card is, a player is welcome to split 8's and continue the game as usual.